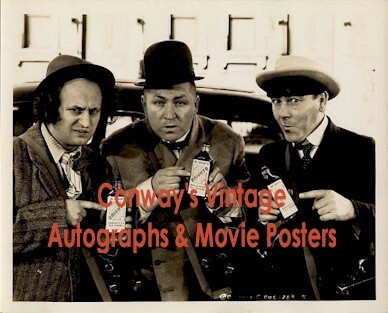 These are not only the most incredible, but the ONLY ORIGINAL press release 3 Stooges photographer stills we have ever seen. 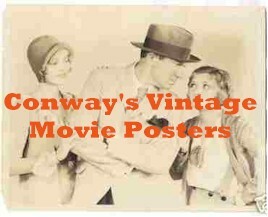 Movie stills (photos) have been issued by studios since the earliest days of cinema. 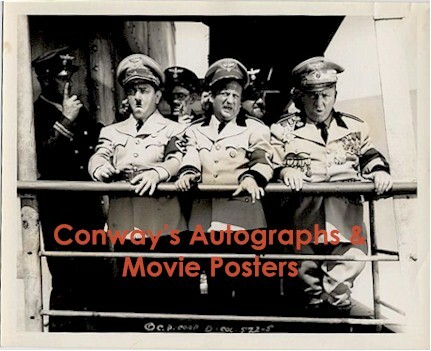 They were sent in limited numbers direct from the studio's publicity department to theaters and the media to promote a new release and the film's stars. These printings had very short printing runs, and the stills became in essence "limited edition" prints. Most movie stills show a movie scene, but also include stunning portrait shots and fascinating candids. Studios recognized the great promotional value of these stills to entice moviegoers into the theater, and often spared no expense in creating beautiful scene stills, portraits and candids taken by some of Hollywood's most accomplished photographers. Many stills are like works of art in themselves and have become iconic images of cinema and 20th Century culture. Since the late '60s stills have taken their place along movie posters and lobby cards as desirable and highly collectible cinema artifacts. More and more collectors are becoming aware of these stills and how desirable they are to collect and/or display. The 30 year still expert who owned these stills say they are the first he has seen in over 30 years. 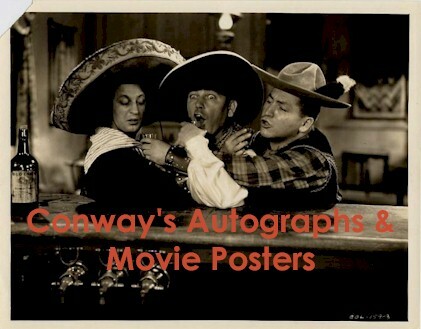 These are even more rare then the movie posters or lobby cards. Very early still with very young Curly and Larry. 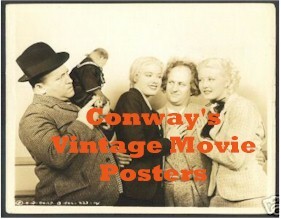 .One of the most extraordinary vintage Stooge still photos we have seen on the market. 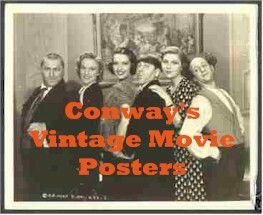 A stunning early 30's ORIGINAL still with great poses. From the 1934 Columbia short "Punch Drunks". Do you ever think you will see another like this again?? Excellent condition with some creasing along right border. 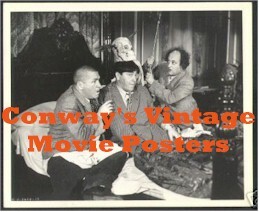 Early 1930's ORIGINAL Stooges still. Excellent condition, especially for a 70 year old photo. 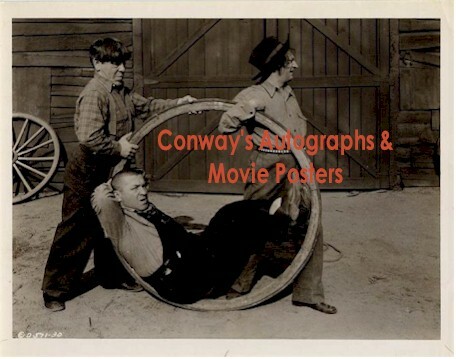 One of the most extraordinary vintage Stooge still photos we have seen on the market. Maybe from their very first appearances together.. 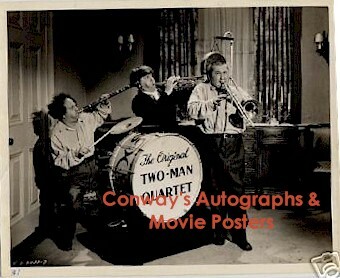 ORIGINAL Studio Promotional Press photo from early 40's. Great scene and excellent condition. 1930 - ORIGINAL 8" X 10" still of THREE STOOGES founding member TED HEALY , FRANCES MCCOY , and LUCILLE BROWN as they appeared in SOUP TO NUTS [Fox 30] , the legendary Rube Goldberg-written first film appearance of THE THREE STOOGES! Most of the ORIGINAL photographer's stills below came directly from the Jules White estate. As any Stooge fan knows, Jules White was the Director and Producer of the majority of Three Stooge's Columbia Shorts. 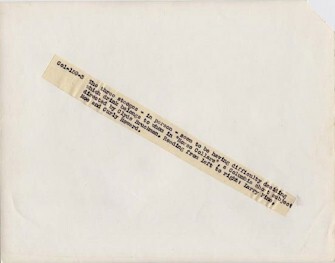 Many of these photos, which I purchased from a family member, includes exceptional provenance including Jules White Last Will and Testament along with a letter from the family member attesting to the acquisition of the Jules White estate. 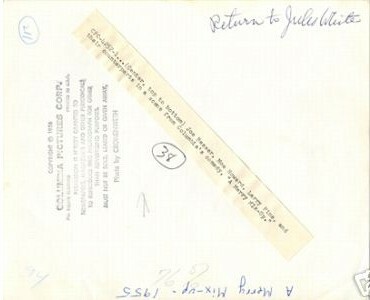 Many of them also have Jules White signature in the form of "Return to Jules White", a studio photographers stamp, or the news print/caption attached on the reverse or two or more of these assets on the back of the photo. 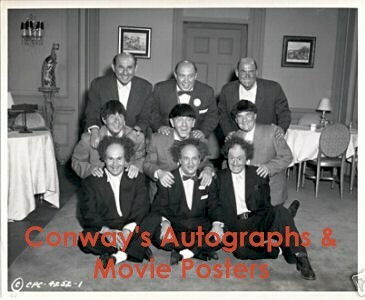 These are all ORIGINAL Studio photo stills taken on the set and ARE not the glossy reproductions sold in stores or on the internet. Our personal red stamp on the front of the photo is NOT on the original. NOT a cheap re-pro, but an ORIGINAL Columbia photographer's still. VERY RARE! 1947 - "All Gummed Up". 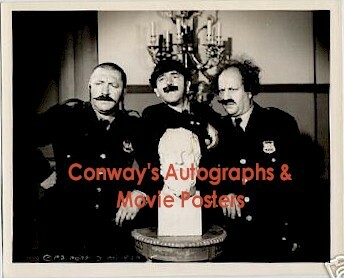 ORIGINAL Columbia Studio still with photographers stamp on back. 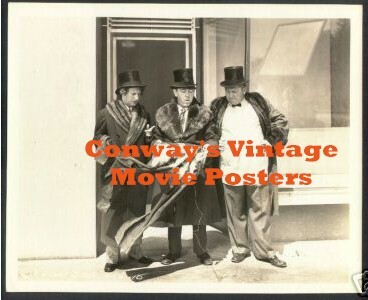 Early vintage still from "Flat Foot Stooges". Excellent condition with Columbia studio photographer's stamp on back, Jules White signature demanding return of this still, and original news/press release clipping. RARE and a real gem! From the Jules White estate. Comes with detailed Jules White provenance. Early 30's vintage still from their Columbia Short "Dinky Detectives". Excellent condition with original news/press release clipping on back. RARE and a real gem! From the Jules White estate. Comes with detailed Jules White provenance. From the early 30's and may be from one of their first Columbia short's together. The contrast and quality of this original still is just amazing! I never knew Moe had freckles until I saw this photo. We are keeping this one for our own collection but wanted to share it with our friends. 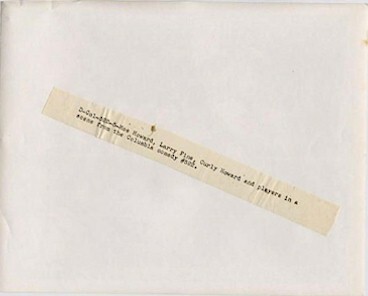 Original early Studio still. Great rare vintage scene from 30's. 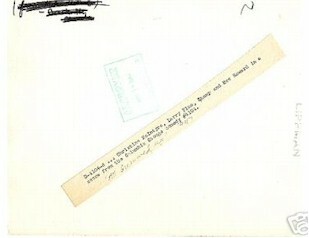 With original news/press release clipping on back. From the Jules White estate. Comes with detailed Jules White provenance. Very early 1930's, maybe one of their first Columbia shorts together. A very striking and extremely high quality original studio still. 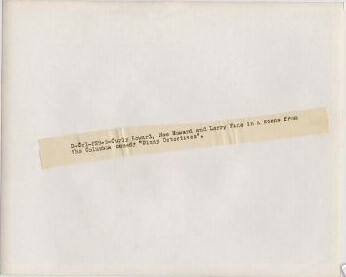 With only a small piece torn from upper left border corner. 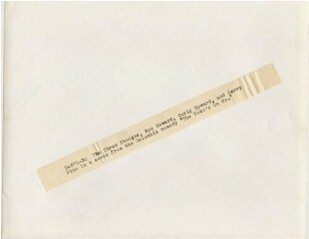 Has original news/press release clipping on back. From the Jules White estate. Comes with detailed Jules White provenance. Early vintage ORIGINAL studio still from 1930's. Excellent condition. From the Jules White estate. Comes with detailed Jules White provenance. 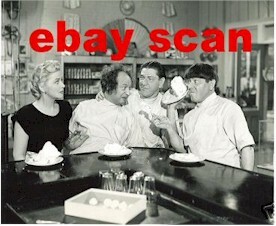 From 1956 - one of my favorite Stooge images of all time. 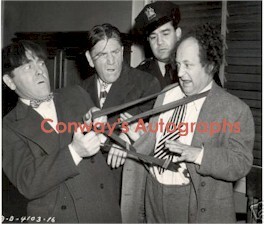 Here, soon after Shemp's passing, Joe Besser teamed up with Moe and larry. Here they star in "Merry Mix-up". Great shot of them with their look-a-likes! 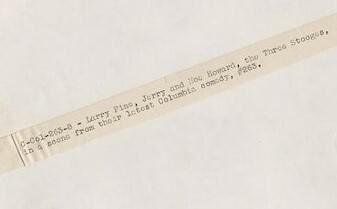 An ORIGINAL Columbia Studio still. 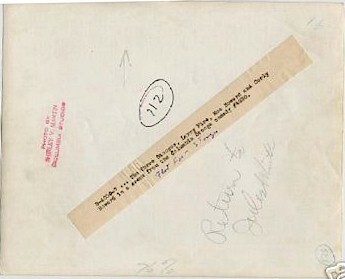 Given to Emil Sitka ("The Fourth Stooge") by Jules White. We acquired directly from the Sitka family. A real beauty!! 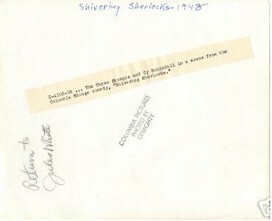 Has Columbia stamp, Jules Whites autograph and original news/press clipping on back!